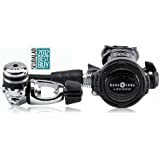 Choosing the best scuba regulator as part of your scuba dive gear may be daunting at first with all the complexity. We have also shared with you how to get your dive computer, what to look out for in when choosing your scuba BCDs and the leak free dive masks that you should be getting for a comfortable dive. How do you separate the wheat from the chaff? That won't be easy, but it will be fun and entertaining with our comprehensive, quick and easy buyer's guide. Hey, we even shared with you some of our favorites to help you with your process. Thank you for visiting Aqua Junkies. 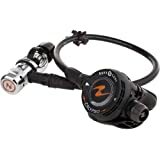 We've done our best to provide you with the most in-depth consumer guide with honest and accurate information relating to the best scuba regulator currently on the market. A significant amount of time has been invested in providing you with this information, so We do hope you find it useful. Most Recommended: If you haven't got the time to read our entire buyer's guide then I would suggest that you check out our editors' choice, Scubapro MK25-A700, a bestselling scuba regulator because of its quality and reliable design that makes diving a breeze with its balanced piston first stage design. It is suitable for most diving conditions in tropical water and cold water. 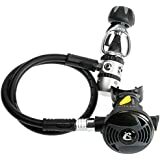 For cold water divers, this beast is CE-Approved for 3360 PSI Cold Water Diving that comes with limited lifetime warranty. Now, Iet's dive straight down into the best scuba regulators in the market right now. How To Take Care of Your Dive Regulator in 6 Easy Steps? 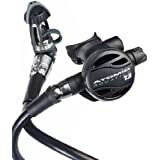 Each month we update this section with the best recommendations within various price brackets and also include the best scuba regulator deals currently on the market, check out below for this month's recommendations! 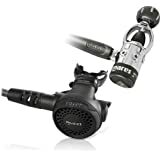 View the best scuba regulator under $500 & above $300! 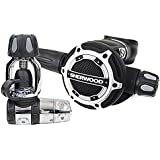 View the best scuba regulators under $300 & above $200! 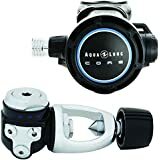 View the best scuba regulator under $200! Here is the short list of the best scuba regulators that we have uncovered during our research through many nights of coffees. The objective of a scuba regulator is to regulate the airflow from the scuba tank in stages as the air flows from the tank to the diver. The regulator first stage is the primary connector to the scuba tank and as its name suggested, it is the first stage of reducing the high pressure air in the tank to a lower intermediate pressure. Air at the intermediate pressure is still not safe to be breathed directly and requires further reduction. Thus, the need for a second stage. Primary second stage is located at the diver's mouth piece where air will flow through the low pressure hose. At this second stage, the intermediate pressure is reduced to an ambient pressure that is equivalent to the air or water pressure surrounding a diver which make it safe for the air to be inhaled by the diver safely. There are two second stages and the primary second stage is one of them attached to a standard open water regulator. This is an alternate air source, buddy regulator or know as the octopus which functions exactly like the primary second stage. The alternate second stage serves as a back-up in case of emergency or when a diver shares air from his tank with a second diver. Alternate second stage are usually bright in color for easy identification and access. Submersible pressure gauge (SPG) helps diver to monitor the amount of air in his scuba tank so that he doesn't run out of air underwater. SPG is connected to the regulator first stage by a high pressure hose that feeds high pressure air from the tank directly to the pressure gauge. Another popular option of monitoring air supply is through dive computer which provides more real time dive data and sharper accuracy on remaining time left before air supply runs out. Low pressure Inflator hose carries intermediate air pressure from the regulator first stage to the Buoyancy Compensator's (BC) Inflator. Divers are able to fill the BC with air from the tank by pressing the button on the BC. The first consideration for buying a diving regulator is to determine what type of diver are you. Are you a recreational tropical diver or you are more of an advanced and technical diver who prefer cold water diving, cave diving or deep diving etc? 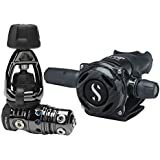 For tropical warm water dive at dive spots such as the Carribean, any scuba regulator should be good enough such as the unsealed scuba regulator. However, if you fall under the cold water diving category, you will need a better and higher end diving regulator with more features to handle the environment conditions. The very first thing you need to look out for is a sealed scuba regulator. More on that below. A sealed diving regulator prevents water elements from freezing inside the first stage, thus blocking air flow during the cold water dive. An environment seals also prevent salt, sediments and other contaminants from entering the first stage. An unsealed diving regulator often used for tropical dive as it does not matter if water infiltrates into the regulator first stage. Therefore, there are usually cheaper than sealed scuba regulator. A balanced scuba regulator provides consistent air flow regardless of the remain air supply left or the depth you are at. An unbalanced scuba regulator will reduce air flow, making it more difficult to breathe when the air supply is at the low level or when you are descending deeper in your dive. A balanced diving regulator makes breathing underwater easier and your dive more pleasant and enjoyable than an unbalanced diving regulator. Although, it cost slightly more but it is definitely a worthy investment if budget allows. Regulator first stage can have a piston or a diaphragm construction. Piston construction is built with less moving parts and thus more reliable. It is often the default choice for deep divers or cave divers. Diaphragm first stages are cheaper and for recreational divers either one is fine. YOKE valve enables the diving regulator to screw over the tank, also known as the A-clamp. This is more common and easier to screw a regulator into a tank. DIN valve requires the diving regulator to be screwed directly into the tank which creates a stronger seal. This is more common with cold water divers and in Europe. Yoke adapter are available for DIN system if you decide to use a Yoke valve tank. Thus, getting the DIN system will be the preferred choice if you are doing both cold water and warm water diving. Generally, most of the dive regulators for diving will have at least 4 low pressure ports and minimum 1 (possible 2) high pressure ports. The more ports available, the easier it is to set up your scuba gear. 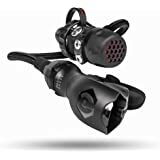 If you are considering to get a dive computer with a transmitter, you will need at least 2 high pressure ports. It is very important to get a comfortable scuba regulator that best fits you. When diving, to enjoy the limited time you have underwater is important. It is often overlooked when people bought their diving regulator. How hard do you have to bite to keep it in your mouth? Is the hose too short and tugging at your head? When you breathe, are there any noise? Do the bubbles go into your face when exhale? These problems can be easily resolved by get a replacement for the problematic accessories such as a longer hose or a ergonomic designed mouth piece. With the information on hand now, you can start finding what is the best dive regulator that matches your needs. 1. Rinse your scuba regulator in warm fresh water as soon as possible after diving. 2. Make sure the first stage dust cover is firmly in place. 3. Do not press the purge button while rinsing. 4. Let the dive regulator dry completely, out of direct sunlight. 5. Coil the host in large, gentle curves before storing it. Keep it as flat as possible. 6. Sent your regulator for professional maintenance service according to the manufacturer's specifications. The Hollis 500SE + DC7 is a scuba regulator system that has been designed for both back mount and side mount configurations. With its environmentally sealed first stage, prevention of icing and other contaminants is secured. The balanced servo-controlled valve provides precision airflow in a side-exhaust configuration. A good choice for both air and trimix technical divers with DIN or YOKE system available for selection. The Cressi Sub Ellipse Scuba Regulator, another awesome quality product from Cressi that is affordable for most divers. While it is small and lightweight, you won't be surprised that this Ellipse Balanced MC9 is one of their best performance regulator that could compete with any high-end regulator on the market at a far better price level. 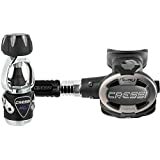 Cressi Ellipse Makes a great travel regulator for your next diving adventure. The Mares Rover 12S Regulator is an entry level product enjoyed much fan fare among many dive centers and entry level divers for its renowned simplicity and reliability. 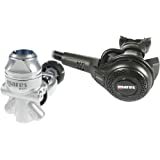 Mares Rover 12s is a regulator that is well-made and provide the sturdiness and quality that every divers are looking for. For the price and the quality you are getting, it is a steal for any starting or experienced diver as a backup regulator. You won't go wrong with Mares Rover 12S. The Scubapro MK25 A700 is a superior maximum performance, top of the line regulator built by one of the most world-renowned scuba brands, MK25 and Scubapro. With a balanced piston first stage and its Ultra-Stable Intermediate Pressure (IP) that delivers consistent delivery of stable air, making it extremely easy for diver to breath regardless of position. A balanced piston construction is always the top choice for the demanding sport or technical divers. If quality and a carefree dive experience matter to you, this is the best choice you be looking at for a high quality, reliable and sturdy regulator. The AquaLung Core Regulator is a Aqua Lung's new mid range regulator. The Supreme version is rated for use in water 50 degrees below zero and comes with an environmentally sealed first stage. Breathing is extremely easy with Core regulator. A Venturi lever system is its core user control well positioned and easy to grip with or without gloves. With its generous features, and at an attractive mid range price, it is the one of the best value regulator in the market today. The Oceanic Alpha 9 CDX5 Regulator is one of the most versatile options on the market. It is simple, economical and reliable. Suitable for both tropical and cold water diving. The sealed, balanced first stage and unbalanced downstream second stage combine to give a smooth, effortless breathing comparable with many of its high-end regulators. Oceanic Alpha 9 CDX5 is easy to maintain and service. 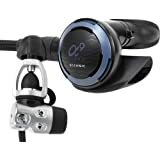 A top choice for divers who are looking for versatility. Mares Abyss 22 Navy ll regulator is probably one of the best options available for the most demanding cold water conditions. Approved to US Navy standards and listed as an authorized scuba gear for Navy use. The Abyss 22 Navy uses the thermal transfer properties of an all-metal design and an oil-filled environmental seal to counteract the effects of cold water. If you are into extreme diving with harsh cold water conditions, this should be one of the regulator in your bag and you won't go wrong with it. U.S. Navy Experimental Diving Unit (NEDU) Approved. Zeagle F8 Regulator has been rated as one of the most ergonomic and comfortable dive regulators on the market. F8 is Zeagle best performing regulator with over 20 new improvements. The F8's second stage is compact, light and comfortable, with built-in anti-freezing features. The purge cover is rubbery, and the hoses come with a soft cover. Being one of the best values available, the Zeagle F8 is a great option if you want comfort without sacrificing performance. 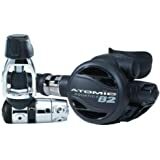 Atomic Aquatics T3 Regulator is a premium diving regulator that set a new titanium standard that offers a compact, lightweight and reliable package. It makes it a suitable choice for picking it up for travelling. It's built with high-quality materials and comes with a 3-year/300 dives service interval. The first and second stage components are precise machine-made with solid titanium billet. 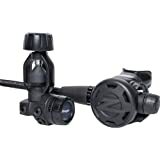 T3 is top of the line regulator choice for the most demanding divers at a premium price. The Sherwood SR2 regulator continues the legacy of SR1 and packs with advanced technology into a compact case. Contemporary in style and fortified the regulator with cutting edge materials. This regulator has a swivel 360º first stage with 5 low pressure ports on it and 2 high pressure ports. With the amount of ports available, it is very convenient to it set up a dive computer with transmitter and an analog pressure gauge at the same time. The price could be more attractive. The best scuba regulator is as much as your lifeline to dive freely and comfortably underwater. It is important to get a trusted, reliable, sturdy and decent quality regulator that provides easy breathing during your dive. Sometimes, price isn't everything. Here at Aqua Junkies, we have picked our top favourites dive regulators that will your diving a breeze and enjoyable. Before each dive, make sure that you do some preliminary checks on your scuba regulator. One of the first thing that you should do is to connect your diving regulator with the tank and take a few short and long breaths. Likewise for the octopus and check the SPG for accurate readings.